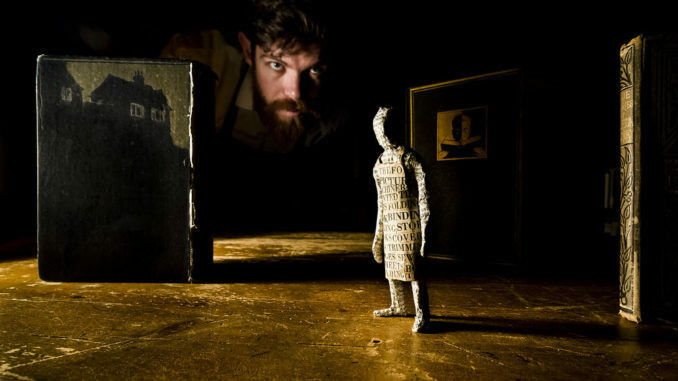 First performed in the back of Arty Bee’s second-hand bookshop in Wellington as part of New Zealand Fringe in 2014, Trick of the Light bring their award-winning production The Bookbinder to the Q Theatre Loft as part of the 2019 Auckland Arts Festival. The dark and magical production written and performed with meticulous care by Ralph McCubbin Howell tells the cautionary tale about an apprentice bookbinder who struggles to fix a book, ‘cuts corners’, and is swept up into an otherworldly adventure. 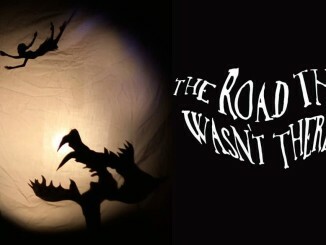 Told with smart and refined simplicity, the production uses a beautifully crafted pop-up book (crafted by the talented director Hannah Smith), table-top and shadow puppetry, and a haunting soundscape (composition and sound design by Tane Upjohn-Beatson) to present a contemporary fairy-tale that charms adults and children alike. A large desk positioned centre stage in the Q Theatre Loft forms a stage within the stage. The desk holds a few books and a pile of paper, a jug of water, and a retractable desk lamp which is manipulated throughout the performance to cast shadows or illuminate and create focused spaces. A man is seated, cradling his head, and asleep on the desk and in front of him facing the audience is a sign that reads ‘Apprentice Sought’. Upstage behind the desk are shelves filled with books forming a small backdrop to the playing area. Stage right is a gramophone playing Édith Piaf and stage left a standing lounge lamp with hanging tassels is positioned near a reading chair. When the lights dim the gramophone begins to skip – waking the man behind the desk who complains about the ‘bloody new-fangled technology’. Noticing the audience, he begins addressing ‘us’ as possible applicants to the available apprentice position. He tells us that Bookbinding is not a vocation for everyone: books unravel, pages turn to dust, and stories are dangerous. 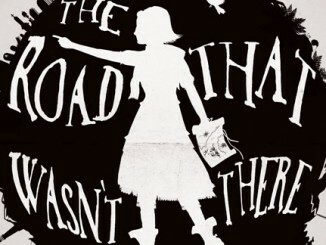 He cautions us: ‘You can get lost in a good book you see. Though its worse to get lost in a bad one’. With this intro the man begins to unfold the story of a bookbinder who left his father in the country and set-off to find his place in the world. Entering an unfamiliar town he takes a job as an apprentice bookbinder and slowly learns the craft. Approached one evening by a mysterious woman carrying an old and tattered book, the apprentice agrees to mend the tome in a single night. In a rush to finish, the apprentice cuts corners, and a page is accidentally left out of the re-binding. Falling asleep the apprentice is drawn into the world of the book and must complete a series of tasks to mend the damage he has caused so that he can return to his own world. In a riddle reminiscent of a Greek tragedy, the apprentice is told that he can only mend the book if he can find: ‘A thread of hair upon your head. A knife from a human shin. A needle from a tooth to bind the softest eyelid skin’. Repeated a few times throughout the performance, the poetic riddle takes on the feeling of an incantation heightening the sense of enchantment that underscores this production. According to director Hannah Smith the idea for the production began in an attempt to adapt a book by American author Chris Van Allsburg, author of Jumanji (1981) and The Mysteries of Harris Burdick (1984). Unable to secure the rights, the company happened across Michael O’Brian – a bookbinder based in Oamaru who originally learnt the craft as part of a four-year apprenticeship at Auckland public library. The inspiring script that Howell has written instead, is simple but sophisticated and makes wonderful use of metaphor to enhance the visual language of the production. Underscoring this production is a love of books and the craft of making and caring for them, and it is this care and precision that is woven through this production. This precision can be traced in the simple (and refreshing) analogue ‘effects’ that the production incorporates to bring various elements of the story to life. These include the position of the desk lamp over simple figurines of characters in the story. The simple precision is used to great effect when a few drops of ink are released into a hand-held water jug to represent a section of the apprentice’s journey over stormy seas. Occasionally the performance simply relies on Howell narrating sections of the story while he turns pages of the pop-up book. In less diligent hands these sections could have been dull – but the beautifully crafted book and the attention and care that is incorporated into the telling transforms these sequences into episodes of table-top puppetry, with the performance breathing life into the illustrations on the pages and working to animate and transform the analogue prop. 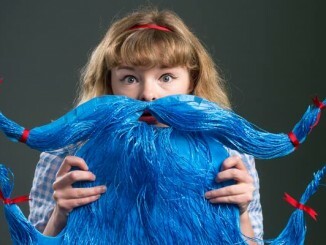 This production reminds audiences about the tactile magic of books and reading, and that care and attention are prerequisites to accessing the worlds between their covers. The Bookbinder was presented by Trick of the Light Theatre at Q Loft, 21-24 March, 2019.